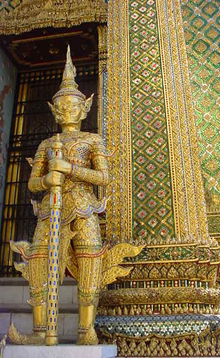 Grand Palace in Bangkok — Grand Palace was built when Bangkok became a new capital in 1782. The Grand Palace complex,which was built by King Rama as his residence and administrative complex, is composed of 100 buildings within four walls stretching 1.2 miles long each.Grand Palace of Thailand is compared to Taj Mahal of India and Forbidden City of Chian. When I was younger I used to complete the Kangaroo flight (from London to Melbourne and vice versa) in one hop – so to speak. With increasing age and enfeeblement of mind, I find myself progressively unable to cope with the 20 or so hours now required to make the journey. I suspect the seemingly more uncomfortable economy class airline seats are major contributors to my unease. Of late, I have been exploring stopovers in southeast Asia where I can take a break to stretch my legs, get a decent meal, and treat myself to a good night's sleep. 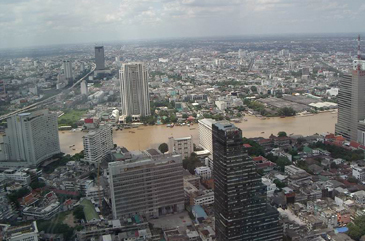 With the possibilities of Kuala Lumpur, Singapore and Hong Kong already tested, I turned attention to Bangkok. The city is not entirely new to me, having been there previously on three occasions, the last being some five years ago. I did not harbor warm memories of the sojourn, but with recent additions to highways, hotel upgrading, and the establishment of a mass rapid transport (MRT) system, Bangkok surely merited another look. I hoped that "the city of smiles" was now more "user-friendly." Unfortunately, I was disappointed in this expectation. Bangkok still remains one of the world's most congested urban sprawls, subject to intense traffic jams and damaging air pollution. Bangkok — "The City of Smiles"
Personally, I shall be scrubbing it from my possible stopping-off points, but for those more tolerant and daring travelers, I offer the following "survival" advice. Getting around: A shuttle bus is available every 15 minutes from Dom Muang International Airport to the city at a cost of 100 baht (2,500 won). Get a taxi from the bus terminus to the hotel for a few hundred baht. A limousine transfer all the way from the Airport to central hotels, on the other hand, will cost in the order of 5,000 – 7,000 baht (124,400 – 174,100 won). Always haggle on the price. Taxis are plentiful and cheap, but take care that the meter is switched on. Another method of transport is the tuk-tuk. These motorized rickshaws, powered by two-stroke engines, are notoriously noisy, and, in heavy traffic or during the monsoon season (June – September), can be uncomfortable and unstable. Tuk-tuk passangers are also subjected to all the lead-soaked air which is at its most dense in the middle of Bangkok's streets. Still, they remain very popular with tourists. It is important to settle the fare, which must never exceed 200 baht (5,000 won), before proceeding. 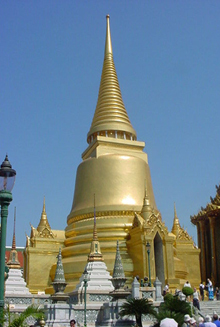 Wat Pra Kaew — Temple of the Jewel Holy Image is one of the holiest sites in Thailand. Watch where you walk: Take special care in and around the street markets on Silom Road. Just a few decades ago this area consisted of orchards; now it is a polluted canyon amidst shopping malls and the overhead MRT system. Pavements might be charitably described as "uneven," while electric cabling serving the stalls spills across the sidewalks ready to upend the unwary. The majority of Bangkok's pavements are in various stages of disrepair. Select a hotel in a convenient location: For me this means conveniently close to shops, markets, restaurants, and transport. 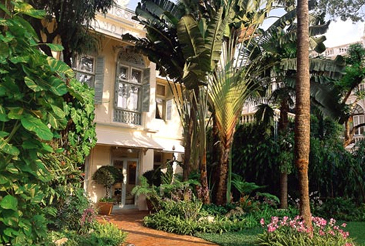 Bangkok is a vast sprawling city and some hotels are situated in more "remote" locations. For example, the Mandarin Hotel is situated in busy Rama IV Road and is a good 10-15 minutes walk to tourist facilities. While I have never felt afraid on the street in Bangkok, some might be deterred by a night stroll, in high humidity, along poorly lit roads, while coping with rutted pavements. Also, motorcyclists tend to use the footpaths to escape the oppressive traffic conditions. Of course, outside most hotels, taxis and tuk-tuks are readily available. Take care crossing roads: Traffic in Bangkok is dense and unrelenting and crossing roads like Rama IV, with four lanes of vehicles speeding in either direction, can be unnerving. Not all traffic lights display the "walking green man," while marked pedestrian crossings may offer little haven, since motorcyclists seem to totally ignore them. I always take my crossing cue from a local – particularly if she is pushing a pram! Beware the market trader: Some are quite open about their wares: "Like to buy a genuine fake Rolex?" Others are less revealing. All the latest music and movie releases are on offer, and any selection will be freshly minted on the spot, for a "nominal" cost. However, the reproductive quality may be poor, and the buyer may end up with an entirely different presentation. Of course haggling is de rigeur at the market. Cultivate selective deafness: Thailand is a nation whose prosperity is built on commerce. Nowhere is this more evident than whilst gaining entry to some of Bangkok's "places of interest." For example, a visit to view the famous Reclining Buddha in the Wat Para Kaew will necessitate running the gauntlet through a phalanx of hawkers and touts offering postcards, photographs and souvenirs. This is where "selective deafness" may prove pertinent. As an alternative, I always have a few words of Irish at the ready; no doubt Korean would also prove a useful coping strategy. When exiting the hotel, be prepared to be badgered by taxi drivers, tuk-tuk operators and motorcycle couriers all touting for business. I try to find a handy service exit. Don't drink the water: unless it is out of a bottle. Bottled water is readily on sale, but purchase only those bottles with an unbroken seal, and beware of the ice! Bottled water is also essential for teeth cleaning. Departure tax: Don't leave all your small change for the hotel room cleaner, or give it to the cabbie as a tip. At Bangkok International Airport there is a departure tax of 500 baht (12,500 won). Reserve enough to cover this impost otherwise you may be in for a longer stay than intended!